Oh god… we enter “Marshak and Culbreath” territory, someone save us… Fortunately, this were not actually written by them, just gathered by. Unfortunately, they have absolutely no idea of what’s good literature. They were actually fans, recollecting fiction made by fans, so technically this is just published Fan Fiction! Ugh, and I hate fan fiction! Why? Because they linger and describe all the wrong things, describing long and lovingly their favorite characters, they put them up in all type of weird situations that are not proper to the series, or to the genre. And the dialogues, ugh! They overuse and overextend the dialogues horribly, repeating and reiterating the same things over and over. Well, to put it succintly, fans do not make the best writers. Well, for starters, it’s nice to have an introduction by Leonard Nimoy, which tries to explain Spocks duality and just further messes up the issue. This one is not that bad. 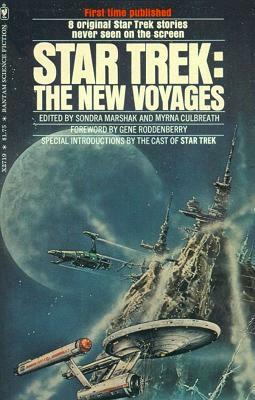 It captures the adventure and the action part of Star Trek, focusing a bit more on Scotty’s character. Here we go… un-educated readers might jump and shout with glee about it’s “originality”, but this is what I would call a “forced-motif”, forcing a story to fit into another totally different theme, and this is totally out-of-the-water and it feels so. This is a story about the fabled Arthurian Excalibur sword forced to match up in a Star Trek storyline. Serious science fiction editors reject this type of stories almost immediately. Nice as a fan-fiction story, not as good as an actual Star Trek story… At least it’s short. A so-so story, about what goes on during shore leave… not very memorable. Spock and McCoy go on shore leave and some of Spock’s weird vulcan ways puts them in trouble. Nice exploration in character bonding, but not much else. A typical alien-on-planet interacts weirdly with the ship’s crew, which will later be beaten to death over and over… An interesting selection of weird it-was-there-all-along alien selection, but it suffers from the fan-fic dialogue problem. Weirdly, the best of the bunch and the best of a lot of stories in a while. It has all the elements, time-travel, mind-psyched-out, adventure, action and a big emotional involvement. I do highly recommend this story ven if the rest of the bunch are not that good. So well, just the last story barely makes it up for the whole book. It would look nice to have different styles of all type of different stories, but it does make it long and tired at the middle of most stories.